A total of 1,331 humpback whale sightings were recorded during the Pacific Whale Foundation’s annual Great Whale Count held on Saturday. 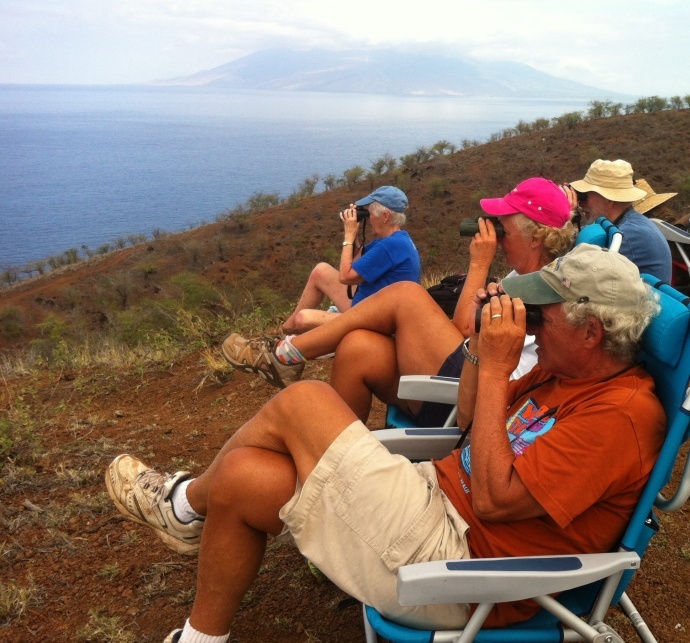 The survey utilized more than 100 volunteers who gathered data on the wintering whales from 12 locations across Maui. 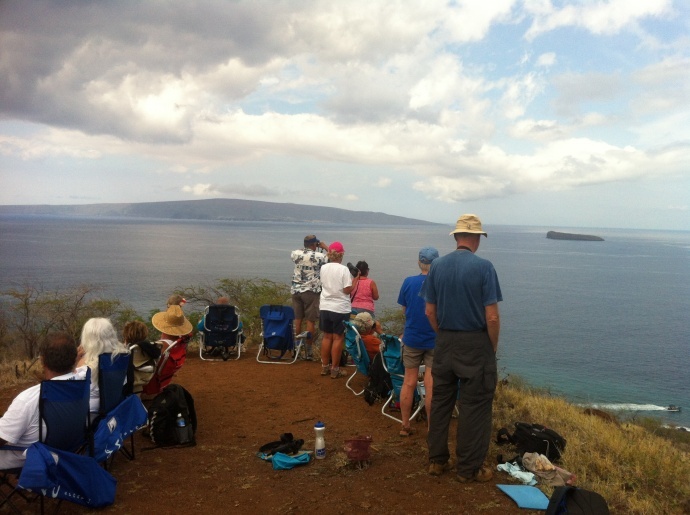 Volunteers at the Puʻuōlaʻi site recorded the largest number of whale sightings, with 214 whales, including 24 calves; followed by McGregor Point, with 168 whales and 360 calves; and Launiupoko Park with 153 whales and 25 calves, PWF representatives said. Great Whale Count. Courtesy file photo Pacific Whale Foundation. PWF representatives say observers stationed in Kapalua observed a mother and calf about 50 meters offshore for most of the morning; volunteers at Māʻalaea Harbor saw a mother and calf breach 20 times in a row; and a pod of about 40 spinner dolphins was sighted off Mākena. 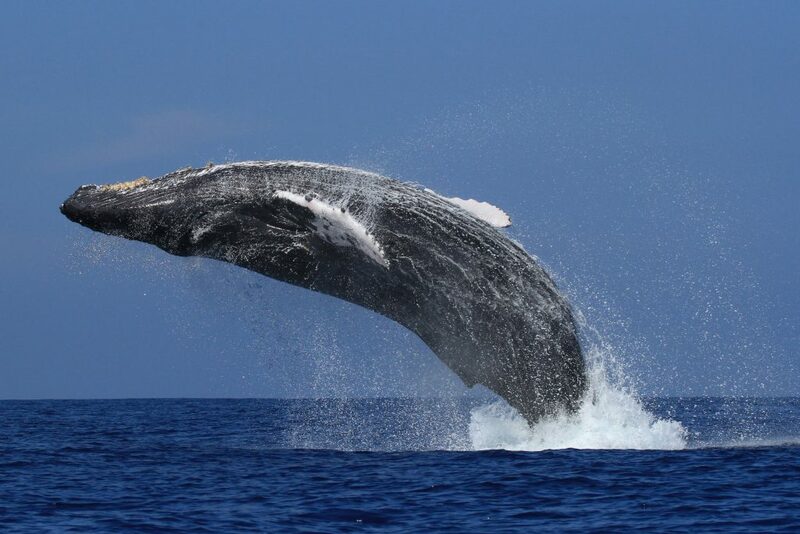 The 1,331 humpbacks counted this year was 205 more than the 1,126 humpback whales that were observed in Maui waters during last year’s event. Great Whale Count, Maui. File photo courtesy, Pacific Whale Foundation. “This is likely a result of mature females being in sync on their calving cycles coupled with the general overall rate of whale population increase at the rate of 5-7% per year,” said Kaufman in an organization press release. 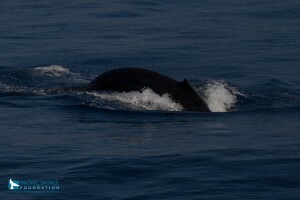 The organization says good sea surface conditions provided excellent sighting conditions this year, compared to last year’s count when gusty trades kicked up the sea and made it harder to view whales. According to Kaufman, the Great Whale Count data correlates with other scientific studies, indicating a steady increase of the population of North Pacific humpback whales. “It is estimated that there are now 23,000 humpback whales in the North Pacific with about 60% — approximately 12,000 to 14,000 — coming to Hawaiʻi over the entire season. Large numbers of these whales are found off the coast of Maui, in the area bordered by the islands of Maui, Kahoʻolawe, Molokaʻi, and Lānaʻi,” said Kaufman. 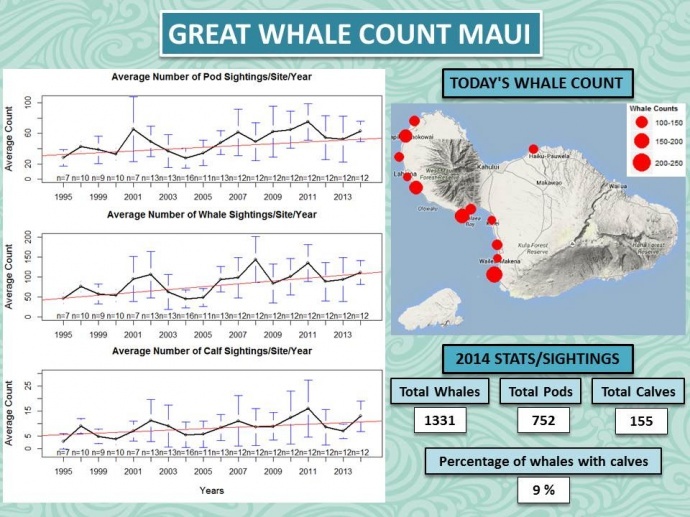 The counting stations extended from Mākena to Kapalua and included the following sites: Marriott in Kāʻanapali, S-Turns in Kahana, 505 Front Street and Launiupoko in Lahaina, Pacific Whale Foundation’s office and Papawai Point in Māʻalaea, Kīhei Surfside near Kamaʻole III Beach Park and the Hawaiian Islands Humpback Whale National Marine Sanctuary Offices in Kīhei, Polo Beach in Wailea, Puʻuōlaʻi in Mākena, and Hoʻokipa Beach Park on Maui’s north shore. Stephanie Currie, Pacific Whale Foundation researcher and coordinator of the 2014 Great Whale Count noted that there was a mix of veteran volunteers and first-timers that assisted with this year’s count. PWF researchers say data from The Great Whale Count is used to supplement field studies. The Great Whale Count is part of the Maui Whale Festival that continues with two evenings of free presentations about whales, to be held on March 13 and 14 at the Westin Maui Resort in Kāʻanapali. The first presentation features a screening of the 90-minute documentary of the movie Blackfish, which takes a look at the world of whales and dolphins in captivity and the circumstances leading to the death of a trainer in 2010. A second presentation spotlights female scientists as role models in whale research. “Heroes in Whale Research,” includes a presentation of work in protecting blue whales in Chile; protecting humpback whales and other marine mammals off the coast of Ecuador; and work with humpback whales and toothed whales and dolphins off Maui. 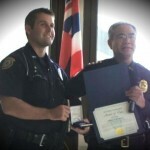 Admission is free but reservations for seating are strongly recommended and can be made by calling (808) 249-8811 ext. 1.